Feature: An Interview With Christopher Arnold From Namitentou! Ping 1.5+ Developer Talks About His Game! We recently had the opportunity to talk to Christopher Arnold the one-man developer of Nami Tentou Mushi about his upcoming Wii U eshop title Ping 1.5+ and he came across as being quite a humorous person during parts of the interview! Well without further ado here is the interview! join us for this interview! [Chris]: It's no problem! It only delayed release by a week. Don't worry. Ha! First off what made you decide to become an indie developer? [Chris]: I've always wanted to make games but I never felt I could ever have the skillset to a proper programmer. But then I was let go from my job and after about a year and a half of no luck of finding a job, I ended up taking the risk of learning how to develop games. It was a hobby at first but it slowly went into a job after the original PING game recieved over 25,000 downloads. That's pretty good for a first simple game, huh? So I decided to take it further. Why did you choose to develop games for the Wii U? [Chris]: I've always been a Nintendo fan. I also knew they were looking for help from the indie part of the industury to help boost Wii U sales. It seemed like an easier target than SONY or Microsoft. Also, I knew about every single indie game that came onto Wii U and I wasn't much of an indie gamer, that means games that came out on it got pretty good exposure just by simply being on there. It could be the difference between being unknown and known? How has your experience working with Nintendo been? [Chris]: Extremely positive and their staff that handles contact with me has always been knowledgable about anything I asked. I also have direct contact with a person too as most developers do and it's been nothing but positive so far. They've really lifted a lot of barriers for indies, as it's quite easy to get the help you need learning your way around their system. Can you tell us a little about your upcoming Wii U eshop title Ping 1.5+? [Chris]: It's inspired by older atari games and it's a unique puzzler. It's hard to describe at times but people compare it to like PONG MINI GOLF and I feel that describes it, although it's not as bad as it sounds. The original game was in 2D, but with this new version we decided to go 3D cubes and it's really added a new look. You'll be doing puzzle stages and fun mini-game boss style stages. We also have 4 crossover stages from BLOK DROP U and also added in 4 Minecraft themed stages (just textures). [Chris]: Try "AXYBAXYBAXYBAXYB" during gameplay. What inspired you to create a modern spiritual successor of Pong? [Chris]: When I was creating my Android game, I was going to go the route of having an animal since I was actually thinking of what made Angry Birds successful. What made that game successful was it's simple controls and aesthetics. I made sure the game would only use touch on the phone and quick. For testing I just left it all squares and didn't pretty it up. 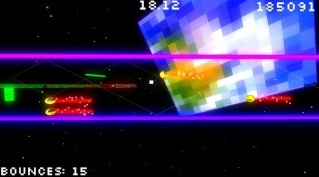 I created the gameplay first and then I realized I really enjoy the retro look to it, so it became 'PING'. arcade titles of the 70's such as Space Invaders and Asteroids? [Chris]: Reddit. I posted the first trailer on there and requested honest feedback from the /WiiU community. They were pretty honest about how boring the levels looked without decoration and then they pointed out how some of my levels resembled other Atari games and how it would be amazing if it was more inspired. I was doing by accident before, I honestly never grew up with an Atari and know close to nothing about the titles. The only known games to me are Space Invaders and PONG. Is there a release window that you are hoping to have Ping 1.5+ released by? [Chris]: Before the end of July if lotcheck is successful? I have low confidence that I'll pass the first time, it's our first game. It's just ASAP at the moment. working on with RCMADIAX and their title Blok Drop U? [Chris]: He's an awful man to work with. He's really bossy and all I get is hate mail from him. Honestly we found out about each other because some website kept on mixing up our games and facts and they would say something like "PING 1.5+" coming to Wii U this March for just $1.99 and posted screenshots of his game or vice-versa. I have a notifier that alerts me to any articles regarding the game so I found out about it pretty quickly. Then we started talking because we both made 'block' games and the idea of a crossover seemed organic to the games. this again in the future! [Chris]: Sure! Probably when I reveal the next title that we officially plan to do. Are you looking forward to ping 1.5+? And what did you think of the interview? Be sure to let us know in our comments below! Re: Feature: An Interview With Christopher Arnold From Namitentou! Mr. Arnold should be a comedian lol. Agreed that is comedy folks!